Media Silent as the World's Largest Prison Population Revolts -- "Refuses To Be Slaves Any Longer"
(RT) On the 45th anniversary of the famous Attica riot, inmates across the US are attempting to bring attention to the dire circumstances that prison populations endure, in the country with the highest incarceration rate in the world, by going on strike. September 9, 2016 marks 45 years since the prisoners in New York’s Attica Correctional Facility took over the prison to demand humane treatment. In the four-and-a-half decades since then, little has improved, according to those living behind bars. Inmates are protesting a myriad of problems facing the incarcerated population, such as the low wages they receive for work they are required to do by penitentiaries that benefit the facilities themselves and private companies that contract out labor to prisons. Some inmates’ grievances were outlined in a list of demands posted on the Industrial Workers of the World Incarcerated Workers’ Facebook page, containing complaints about the conditions prisoners in South Carolina face. Included on the list of seemingly basic human rights was an end to free labor by prisoners in the Palmetto State, where private companies were criticized for using prisoners as skilled labor but paying them under $2 an hour. “We hope to end prison slavery by making it impossible, by refusing to be slaves any longer,” they explained. The uprising at Attica 45 years ago made similar demands, as IWOC’s co-chair Azzurra Crispino explained to RT. The last one is a big one. While inmates across the country are protesting many problems, such as being served moldy food or, such as in Texas, being confined to concrete cells with no air conditioning with temperatures reaching over 100 degrees (38 C), the labor issue by sheer volume is the most contentious. 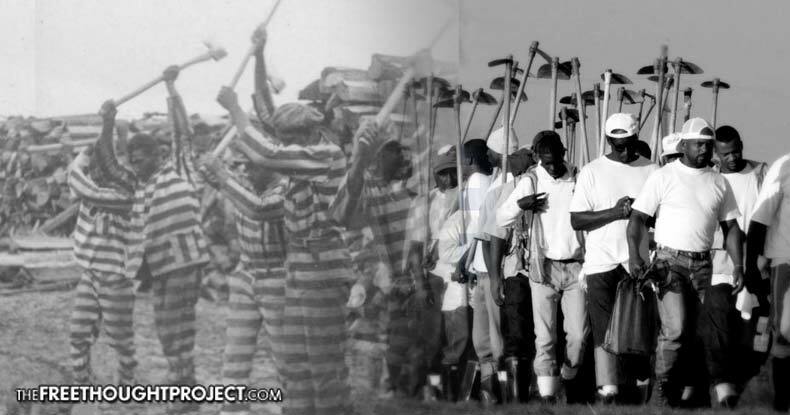 There are over 900,000 inmates working out of the 2.4 million prisoners in the country. In some states, calling the DMV means the person on the other end of the phone is an inmate, certain brands of underwear have been sewn by the incarcerated, and the cost of prison operations is offset by inmates who are tasked with keeping the facilities running by providing food, maintenance and labor. However, many of them will be lucky to receive even a dime for their work. However, with the fifth highest incarceration rate in the country, the Alabama Department of Corrections has a backup plan. Should the protest continue, inmates in a nearby work release facility will take over work at the tag plane, WNCF reported. The plant is “where all of the State’s motor vehicle tags are manufactured,” according to the prison’s website. Slave labor in the US is banned under the Constitution’s Thirteenth Amendment, save for one clause: people who are “duly convicted” of a crime. This is why wages for prisoners fall well below the federal minimum wage of $7.25 an hour, reaching bottoms of 15 cents an hour, while some states are allowed to not pay their prisoners at all. Alabama, Arkansas, Georgia and Texas are all allowed to force inmates to work for free, the Nation reported. Meanwhile, large corporations, such as Victoria’s Secret or AT&T, are allowed to sell work contracts to state and federal prisons that outsource work to earn them billions of dollars. In addition, some states use prison work programs as means to make products for state use. This is what has led prisoners across the country to participate in a national strike. On Friday, protests across the country took place to show solidarity with the protesters behind bars. The full effect of the protests will not be known until later, but perhaps this will be one step closer to fixing the problems that persist in the country that holds 25 percent of the world’s incarcerated population.